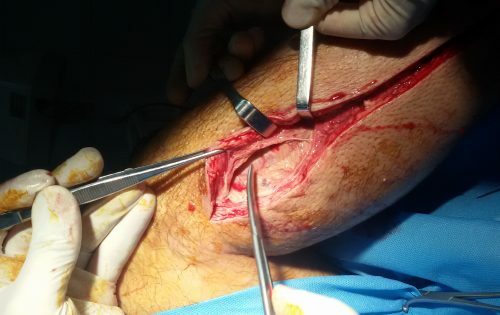 Compartment syndrome is defined as a critical pressure increase within a confined compartmental space. This condition causes a decline in the perfusion pressure to the compartment tissue, which without timely diagnosis and treatment will lead to ischaemia, necrosis, and permanent disability of the affected region. If left untreated, compartment syndrome can lead to limb loss, multi-organ failure, and death. In this article, we shall look at the pathophysiology, clinical features and management of acute compartment syndrome. Compartment syndrome typically occurs following traumatic injury or fractures that cause vascular injury. However other causes include iatrogenic vascular injury (post-operatively), tight casts or splints, deep vein thrombosis, and post-reperfusion syndrome swelling. Where there is a closed (fascial) compartment, any fluid that is deposited therein will cause an increase in the intra-compartmental pressure. As this pressure increases, the lower pressure venous system will first be compromised, so leading to venous congestion and a further increase in the intra-compartmental pressure. The capillaries will subsequently be compressed and arterial supply to the muscles will cease, leading to ischaemia and subsequent infarction. In the final stages, the arteries will be compressed, however the condition should be recognised well before this point. The most common sites affected are in the lower limb (anterior tibial, peroneal compartment, and the superficial & deep posterior compartments), however it can also occur in the forearm (ventral and dorsal compartments) and rarely in the gluteal region and abdominal cavity. Other features may include paraesthesia in the cutaneous distribution of the affected nerve (secondary to nerve compression) and a generalised muscular tenderness and swelling. If the disease progresses, the features are acute arterial insufficiency will subsequently develop (often referred to as the ‘5 P’s’): Pain (disproportionate to the injury), Pallor (or mottled, which becomes non-blanching), Perishingly cold, Paralysis, and Pulselessness. The diagnosis of compartment syndrome is essentially clinical, based on the symptoms and risk factors present. Clinicians should have a high degree of clinical suspicion for compartment syndrome in post-operative patients. Compartmental pressure can be measured by various methods if needed; in situations where the diagnosis is in doubt, an MRI scan of the affected compartment is often the most clinically useful. The definitive treatment is with an emergency open fasciotomy (Fig. 2) to relieve the pressure inside the compartment. The skin incisions are left open, and a re-look is planned for 24-48 hours. Monitor electrolyte and renal function closely, due to the potential effects of rhabdomyolysis or reperfusion injury.